A man has been jailed after he was caught with a gun and ammunition on the M32 motorway in Bristol. Mathias Frederick was stopped by police while travelling in a car on Saturday, July 7. A quick search by officers revealed the 39-year-old was in possession of a revolver, described as a Smith and Wesson, and 12 Russian-made bullets. Frederick, of Shakespeare Street in Birmingham, was jailed for seven years following a hearing at Bristol Crown Court on January 14. Detective Inspector Tom Herbert, of Avon and Somerset Police, said: “I’m immensely proud of all the officers who worked to take this weapon off our streets. “This was a pre-planned operation involving specialist firearms and intelligence officers and staff and co-ordination with other forces. We prevented a lethal weapon from reaching its intended destination. The outcome is it’s now off our streets. “We’ll continue to take every opportunity to identify, locate and seize illegal firearms and prosecute those who possess them. 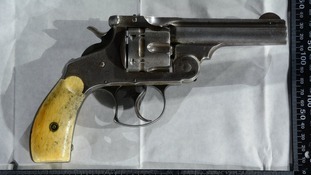 The court ordered the destruction of the revolver and ammunition seized.